This powerful bundle contains 10 resources to help you plan, communicate, review, and track goals for Grade 5 math curriculum all year long! All resources are based on the same set of 51 student-friendly goals aligned to Common Core. 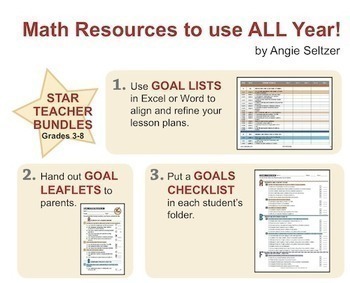 The PREVIEW downloads quickly and includes a one-page visual overview of the Star Teacher Bundle along with Grade 5 goals and a free Common Core overview poster. The FREE Grade 5 Math Goals Leaflet includes descriptions of these resources plus math card games and how they are coordinated. The codes for each card set represent the grade, domain, cluster, and goal number in the free checklist. HINT: Jot down these codes to use later as search terms. 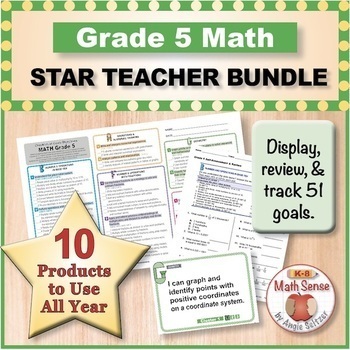 • COMMON CORE MATH STANDARDS POSTER SETS: Grades K-8, Grades K-5, or Grades 4-8. 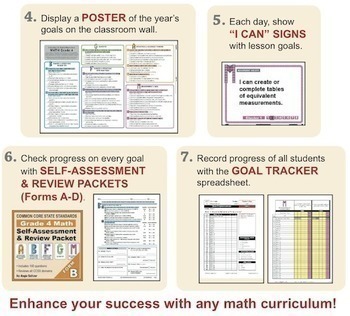 Get one poster per grade level showing all goals organized by cluster. • MATH CARD GAME BUNDLES: Kindergarten, Grade 1, Grade 2, Grade 3, Grade 3, Grade 4, Grade 5, Grade 6, Grade 7, and Grade 8. • BASIC FACTS CARD GAME BUNDLES:Addition Facts Bundle (9 sets),Subtraction Facts Bundle (9 sets), Addition and Subtraction Fact Families Bundle (9 sets), Multiplication Facts (8 Sets), Multiplication and Division Fact Families (9 Sets), Division Facts (8 Sets). 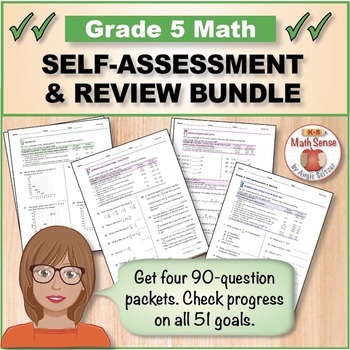 • MATH REVIEW BUNDLES: Grade 3, Grade 4, Grade 5, Grade 6, Grade 7, and Grade 8. For each grade level there are 4 parallel review packets that can be used to check progress. Questions are correlated to the student-friendly math goals. Please FOLLOW this store to be notified of future products. Also, this FREE product took much time and effort to create. If you like it, please leave feedback and tell others. Thanks for looking!